This Tool will help you to get all the information needed to survive at a Poker table. You can put them on Ranges (Full version only), give them a specific hand or put them on a random hand. 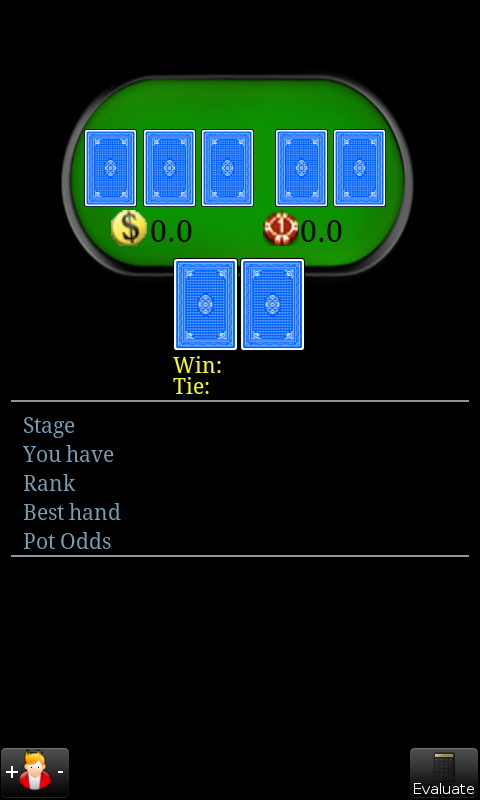 Here you see all the necessary interactive items to rule the poker table. Top there are the Community cards buttons. 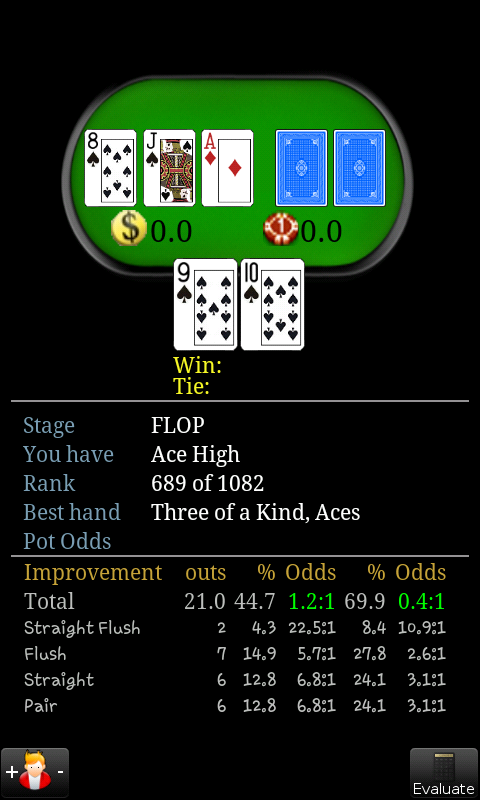 The three to the left are the flop cards followed by the turn and river cards. Underneath them are the "Potsize" (left) and the "To call"(right) Buttons. 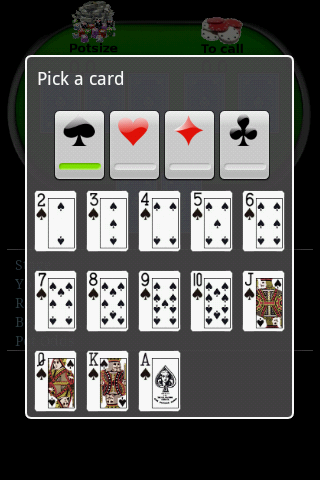 At the bottom of the table, your hole cards are shown. The space under the buttons is used for the information, which will be generated depending on the cards and potsize you will enter. In this dialog you can select the card of your choice. So, lets enter our hole cards. Note: If you longpress one of the cards button, the selected card is deleted. 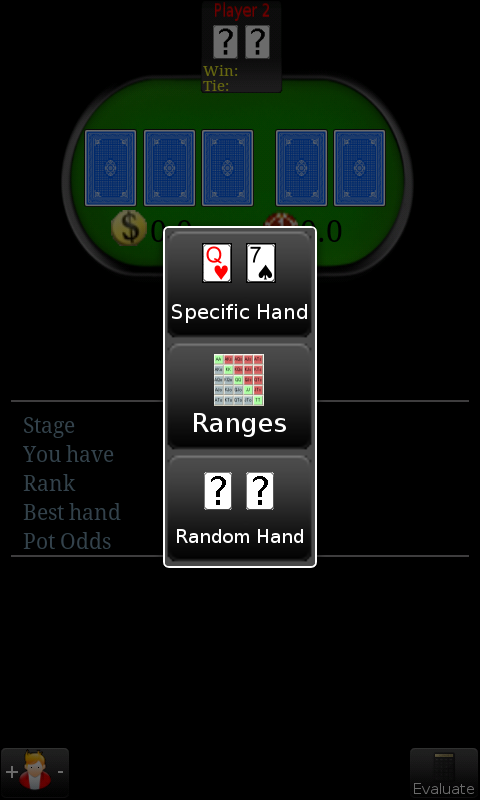 As you can see, the tool informs you about the actual rank of your hand and lists the top hand of the current stage. Now we can see the rank of our hand and the best hand at the current stage for the given cards as befor, as well as the outs and odds for improving our hand. The first column "Improvement" lists you all the possible hands which can be reached by the next card. The "outs" column list you the number of cards for these hands. The first "%" and "Odds" columns show you the percentage and respective odds for the Turn the second columns will show you the percentage and odds for the river. 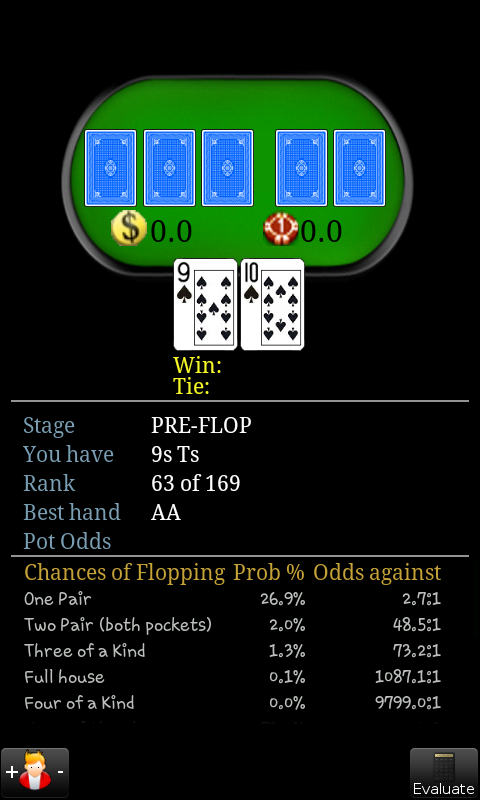 Note: When you are at the "FLOP" stage, the second "% Odds" shows you the respective information for the Turn and River combined. As you can see, the "% Odds" for the Turn disappeared and only the columns for the River are shown. Sometimes it is necessary to ignore the outs for a specific hand in order to rank your hand correctly. 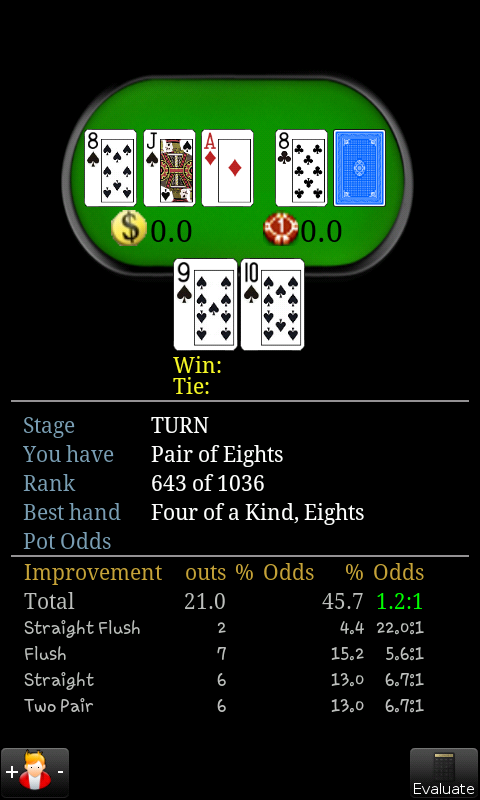 Somehow you feel, that you will not win the pot if you only have a pair at the end and therefore the six outs for the Pair-hand could be ignored. Note: To remove the "ignore" symbol-just click the Pair-row again. 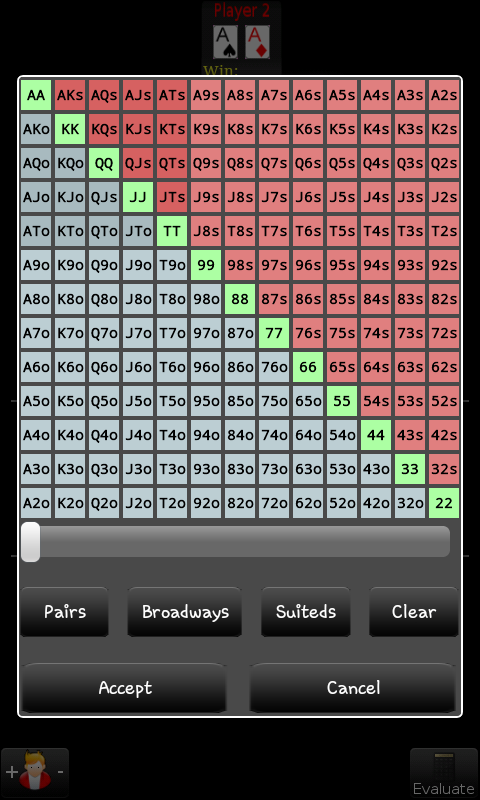 Another way to customize the given outs of a hand is to count them as partial outs. This could be the case if you feel that the hand will not necessarily improve your hand. the outs of this hand as partial outs. Note: To remove the "partial" symbol, just longpress the row again. To consider the Potodds, you have to enter the Potsize as well as the amount of money to call. Here you can enter any amount you like. or unrentable (color of Odds red) for the actual Outs. If you select "specific hand" you can give this opponent a concrete hand e.g. a Ace of Spades and an Ace of Diamonds. And if you have no idea which hand your opponent has you can put him on "random hand". NOTE: If you accept an oppontent hand type, you will return to the selected hand-type dialog by clicking the opponent button. That means if you put an opponent on ranges you directly return to the ranges dialog after clicking the opponent button. If you want to change the type of the opponent hand, you have to LONG-CLICK the opponent button. We hope you have now an idea of the power of the tool and could solve all your queries. 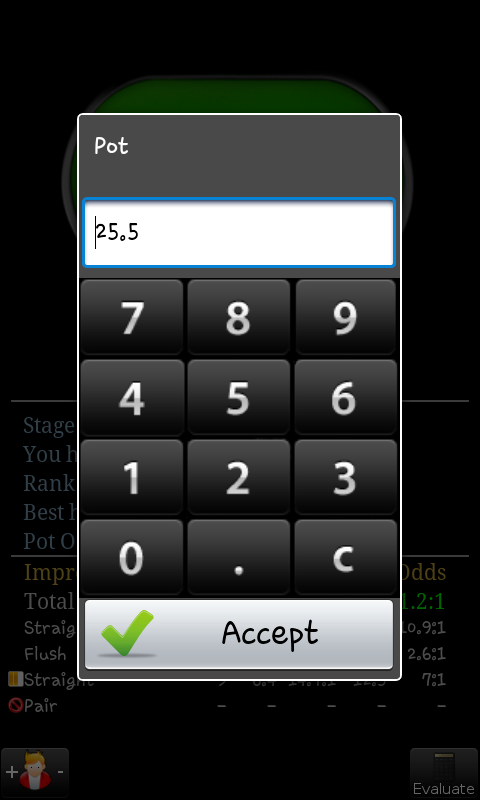 Download the full version of Poker Odds and Outs Calculator for Android! 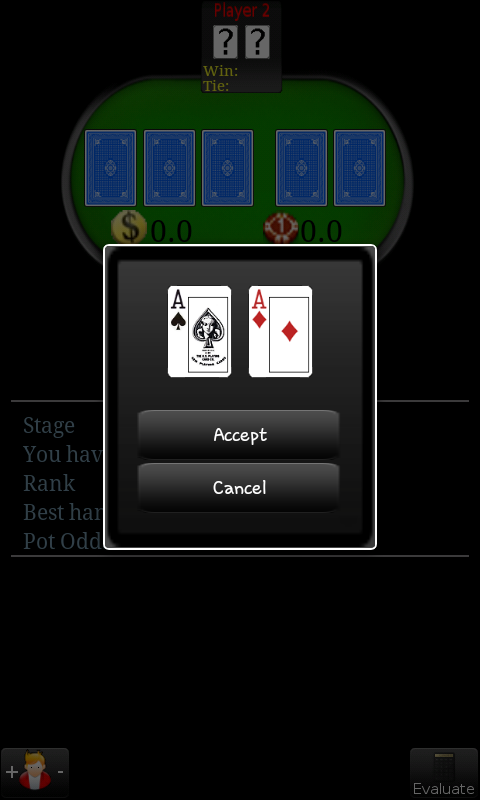 Download the LITE version of Poker Odds and Outs Calculator for Android!